Why Choose Perforce Version Control Software? Your teams deserve the fastest, most scalable tool for source code and digital assets. Helix Core (P4D) is version control software for accelerated development. Helix Core securely versions source code and all digital assets — even large binary files — in a single repository. It scales for large teams, handles 1,000s of daily transactions, and delivers files quickly to remote users. And Helix Core integrates with the tools your developers and designers are already using to keep them productive. Tell your team about Helix Core. Get the Product Brief. 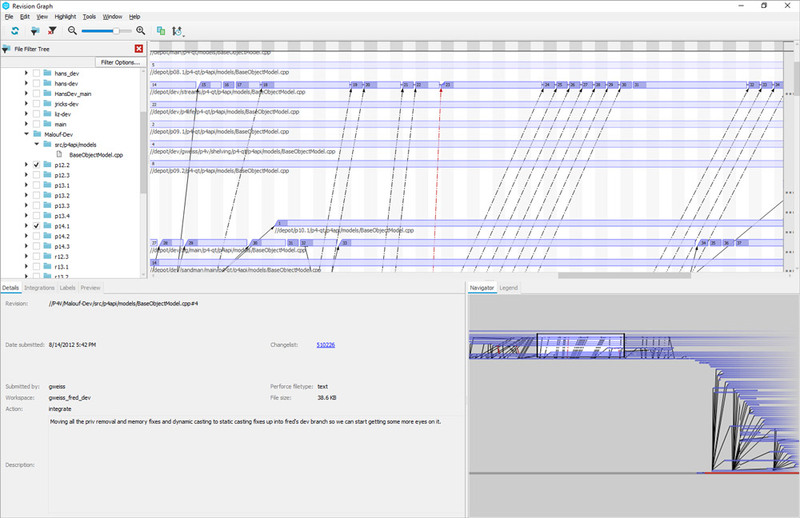 What Makes up Perforce Versioning Control Software? Free for up to 5 users. Try Today. Desktop access to versioned files. Optional add-on to scale Git. Everything you need to develop better software faster. Helix Core makes it easy to maintain a single source of truth. Store everything — from source code and graphics to test scripts and artifacts — in one repository. Lock files to prevent overwrites on binaries. Roll back entire changelists without losing your audit trails. Helix Core keeps up with the fastest teams. It handles 10,000+ concurrent commits and intelligently syncs across locations. You’ll always be working with the latest version. Helix Core uses a branching structure called Streams. Streams let you to organize your codelines and implement policies across branches. Create dedicated Streams for specific tasks — from release and innovation to back-end and front-end code. 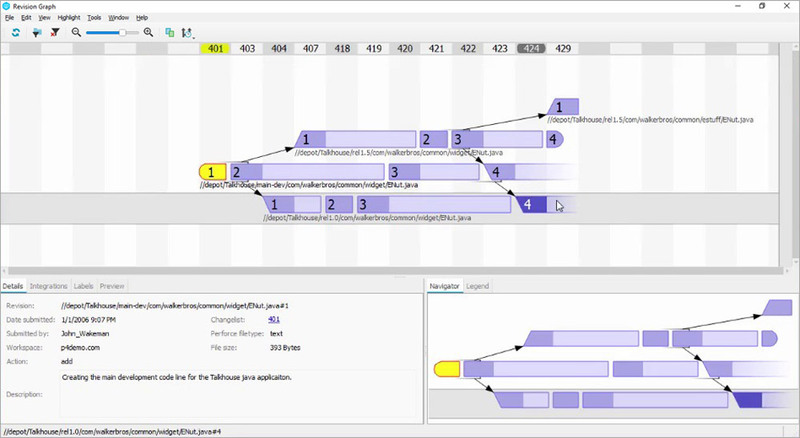 And advanced visualization tools help you quickly see the evolution of your code and propagated changes across files and branches. Helix Core’s sophisticated caching and replication technology lets your global teams innovate at unrivaled speed and scale. Local servers keep your remote sites synchronized with central servers. And they allow your global teams to access and manage files at LAN speed — without compromising security. All transferred data is secured via SSL encryption. With Helix Core, you get complete change history of all digital assets — from source code to binary files. Generate per-file access logs to meet regulatory compliance without sacrificing speed or flexibility. And use visualization tools to quickly discover the source and history of a change. Integrate Helix Core with Helix ALM for streamlined compliance audits. This powerful duo lets you manage requirements and test cases alongside your code and artifacts for end-to-end traceability. Helix Core makes it easy to secure your valuable assets and control what users see and do. Take advantage of fine-grained access controls — down to the repository, branch or individual file level. You can authenticate with LDAP or Active Directory. 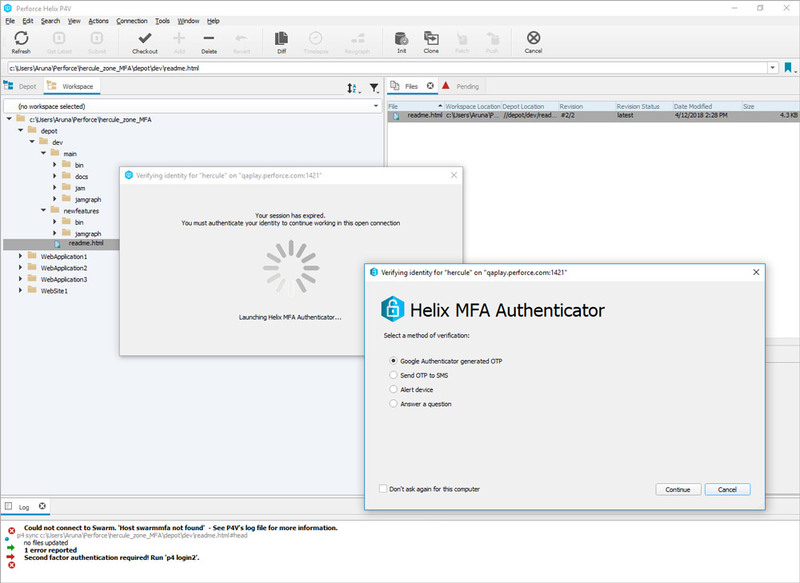 And Helix Core supports multi-factor authentication and Helix SAML. Helix Core integrates with the tools your team already uses — like Jenkins, Visual Studio, Jira, Eclipse, Photoshop, Autodesk, Maya and more. Designers and developers can version files and multimedia assets without switching tools. Admins can automate builds in Jenkins for seamless CI/CD. And the flexible APIs let you tailor Helix Core to your unique requirements, tools, and workflows. Harness the power and speed of Helix Core to version, develop, and ship your products faster — for free! The full version of Helix Core is free for up to 5 users. Want Helix Core (P4D) in the Cloud? Tired of maintaining your Helix Core server on-premises? Our professional services team can help you get your Helix Core server set up on Amazon Web Services. Want to migrate to the cloud but don’t have the technical resources or desire to maintain a cloud instance? Let Assembla deal with that. Discover version control tips and best practices for simplified development. Accelerate development, get a single source of truth, and protect your intellectual property. Try Helix Core (P4D) free for up to five users. See Helix Core (P4D) in action during a live demo.